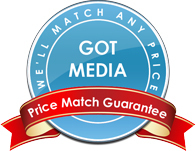 Verbatim has been long recognized as a top quality blank BD-R media manufacturer. 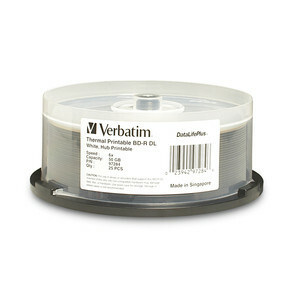 A full line of Verbatim BD-R media and Verbatim BD-RE media is offered right here in Orange County, CA at GotMedia.com. Verbatim incorporates the latest technologies to its proven quality control strategies to ensure the reliability of its BD-R and BD-RE blank media products. All Verbatim Blu-ray discs are backed with a limited lifetime warranty and a 40-year history of the highest quality and reliability. As an established leader for stability and reliability, be sure to see our line of Verbatim DVD-R Media and Verbatim CD-R Media products as well. Print Surface: Inkjet printable, DVD pen. Verbatim 97238 is a DataLifePlus blank recordable Blu-ray disc, BD-R. 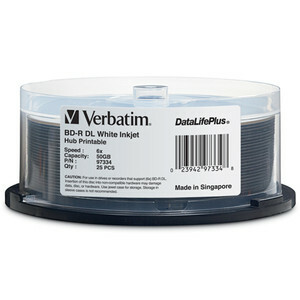 These Verbatim BD-Rs have a branded surface that is used for simply writing on the surface with a DVD pen. Packaged in 10 pack spindle. 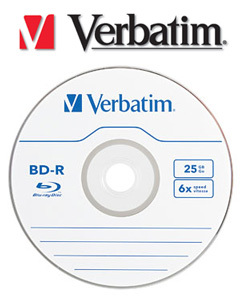 Verbatim 97339 is a DataLifePlus blank recordable Blu-ray disc, BD-R. These Verbatim BD-Rs have a white inkjet hub surface which is best suited for users that want to print on the surface with a color inkjet printer, or just simply write on the surface with a DVD pen. Packaged in 50 pack spindle. 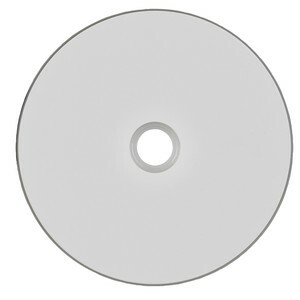 Verbatim 97338 is a DataLifePlus blank recordable Blu-ray disc, BD-R. These Verbatim BD-Rs have a white thermal hub printable surface which is compatible with Everest and Teac color thermal printers. 6x record speed, Packaged in 50 pack spindle. Verbatim 97334 is a DataLifePlus blank recordable Blu-ray Double Layer disc, BD-R. These Verbatim BD-Rs have a white inkjet hub surface which is best suited for users that want to print on the surface with a color inkjet printer, or just simply write on the surface with a DVD pen. Packaged in 25 pack spindle. 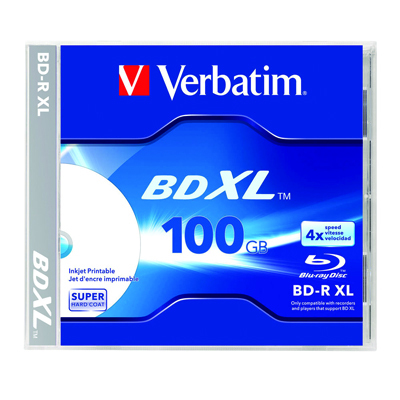 Verbatim 97284 is a DataLifePlus blank recordable Blu-ray disc, BD-R. These Verbatim BD-Rs have a white thermal hub printable surface which is compatible with Everest and Teac color thermal printers. 6x record speed, Packaged in 50 pack spindle.